The National Driver Licence Service (NDLS) is the name given to the new services to receive applications for the learner permits and driving licences. 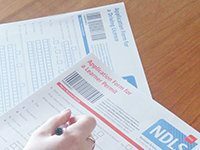 Instead of applying for your driving licence or learner permit at your local Motor Tax office, applicants need to apply in person at one of the new NDLS centres around the country. The NDLS will provide at least one centre for every county in the Republic of Ireland. The NDLS will introduce 34 licensing centres nationwide. The centres are located across the country and aim to service 95% of the population with a centre within 50km of their radius. The cost of a Learner Permit will remain at €35. To replace your current paper Driving License or Learners Permit with the new license is €35. As part of the new face-to-face process, your photo and signature will be taken digitally at the centre by a Customer Service Agent. There is no extra fee for this service as it is included in you overall learner permit or driving licence application fee. What’s required to process your application? A face-to-face assessment with a NDLS Customer Service Agent at the NDLS centre. Existing driving license or learner permit. Additional confirmation of your identity eg. Passport or Garda Identity Card.